You can now use the available alert webhook functionality to receive alerts for SAP Cloud Platform applications locally in your on-premise system. 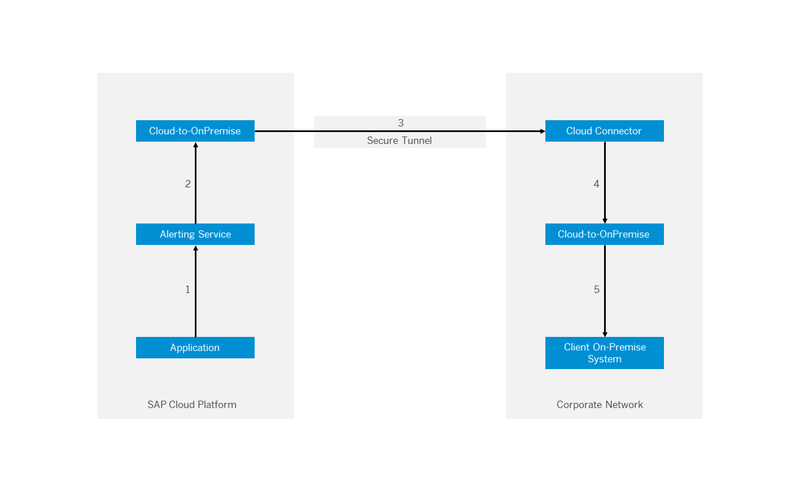 For example, you can extend your on-premise application located in the corporate network to show alerts for critical or warning metrics of an SAP Cloud Platform application or to take self-healing actions. The alert webhook functionality is currently available for the Neo environment of SAP Cloud Platform. You need to use the Alerting Channels REST API to configure the channel for receiving such alert notifications. In addition, you need to configure a cloud connector and a destination for the connection from the cloud to the on-premise system. Alerting Service receives a notification when a critical, warning, or recovery metric is detected. For example, the application’s response time has reached the critical threshold. Alerting Service sends an alert to the Cloud-to-OnPremise application on the cloud. The Cloud-to-OnPremise application sends the alert to Cloud Connector through a secure tunnel. The Cloud-to-OnPremise application receives notifications from Alerting Service and acts as a proxy for the on-premise system. The Cloud Connector redirects the alert to the on-premise Cloud-to-OnPremise application. The on-premise Cloud-to-OnPremise application stores the alerts in the Client On-Premise System as a JSON file. That way you can implement your client on-premise system to process the received JSON file according to your needs. To configure and test this scenario, please use the tutorial Receive Alerts in Your On-Premise System Using Java Web Tomcat 8. Although the tutorial explains the configuration in Java Web Tomcat 8 runtime, you can change and adopt it to match with your runtime.